How can an inverter be used? With a large enough battery bank, or a large enough alternator output from your vehicle, and a powerful enough inverter, most anything, within reason, can be operated from a power inverter. Everyday appliances such as microwaves, power tools, TVs and VCRs, lights, audio/visual equipment, battery chargers, and computers. A heavy inrush inverter can be used to power air compressors, water pumps, heaters, ventilation fans, and air conditioners. Pure sine inverters are ideal for running sensitive test equipment: oscilloscopes, scales, stereos & video equipment, etc. What is the difference between Modified & Pure Sine Wave? 1. Modified sine wave inverter: The most common, general-use inverters available are of the "Modified Sine Wave" variety, usually available at more moderate and competitive pricing. Modified or Sine Wave output inverters are designed for efficiency while still being inexpensive to make. Although scientifically designed to somewhat simulate Pure Sine Wave output, Modified Sine Wave inverters do not offer the same "perfect" electrical output (see diagram below). As such, a by-product of Modified sine wave output units is electrical noise. Some lower-grade TVs and stereos use power supplies incapable of eliminating common mode noise. This may cause a "hum" on your radio or sound system or a "grain" or small amount of "snow" on your video picture. 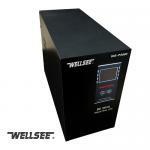 The main drawback with Modified sine wave inverters is that some appliances with timing devices, light dimmers, and some battery chargers, as well as variable speed devices may not work well, or indeed, may not work at all. Modified or Quasi Sine Wave output inverters are more than adequate for operating computers, drills, saws, microwaves, refrigerators, fans, pumps, and general electrical equipment including most small motors (except for some variable speed motors). For your kids to watch TV in the car, or to power lights at the summer cabin, Modified sine wave output should be quite satisfactory. audio/visual equipment. If your application is an important video presentation at work, opera on your $1000 sound system at the beach, suveillance video, a telecommunications application, any calibrated measuring equipment, or any other sensitive load, Pure Sine Wave is ideal for you. 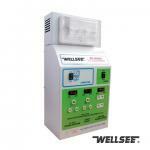 Oxygen concentrators and breathing operators require a Pure Sine Wave inverter output, usually 1000 Watts. 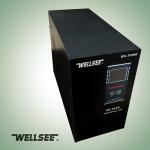 WELLSEE have modified wave inverter and pure sine wave inverters, you can see the related goods on the left side. Next： how to choose a solar charge regulator? Previous： What is a solar electric or photovoltaic system?